A voicemail message left by Prince Harry, in which he asked an aide for help with an essay, was hacked by the News of the World, a court has heard. The Old Bailey jury saw a transcript of the message left while the prince was at Sandhurst military academy. The 2005 document was one kept by former NoW royal editor Clive Goodman, who denies misconduct in public office. He is one of eight people who deny a series of charges. Five are former News of the World journalists. Goodman was jailed for phone hacking in 2007 and subsequently dismissed from his job. The then editor of the (NoW), Andy Coulson, told a senior journalist investigating an exclusive story on television celebrity Calum Best to "do his phone"
In that email, Goodman said: "These people will not be paid in anything other than cash because if they're discovered selling stuff to us they end up on criminal charges, as could we." Prosecutor Andrew Edis QC told the court that documents from Goodman's employment case against News International, which owned the now-closed NoW, had recently become available after he waived his legal privilege. Goodman kept the documents as evidence to show that what he had done had been sanctioned at a high level of the NoW, Mr Edis said. The first document shown to the jury was a transcript of the voicemail message Prince Harry left on the mobile phone of Mr Lowther-Pinkerton, an ex-SAS man serving as his private secretary, in which the prince asked for information about the 1980 Iranian Embassy siege in London. The transcript included the words: "Just wondering if you have any info at all on siege on the Iranian embassy because I need to write an essay quite quickly on that. I need some inf. Have most of the stuff but if you have extra." Mr Edis told the jury that the voicemail came to the attention of Goodman, who was interested in it as a potential allegation of misconduct to do with essay writing against Prince Harry. 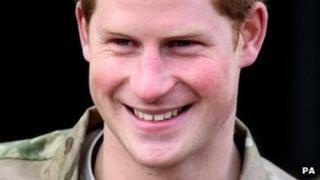 The prince was doing his officer training when the events took place around December 2005. The message was accessed by private investigator Glenn Mulcaire, who was jailed for phone hacking along with Goodman in 2007 and has admitted further phone-hacking charges. The court heard there were discussions between Goodman and his boss, Mr Coulson, about how to run the Harry story without exposing its source. They decided not to refer to the siege in their coverage as it would be "too precise to get through unnoticed". Mr Edis said: "Everyone would know that they hacked his voicemail because obviously Harry and Jamie Lowther-Pinkerton both knew that this voicemail was sent and received." Mr Edis suggested to the jury that the reason Goodman had kept the emails was because of his arrest. Goodman's prosecution caused Mr Coulson, 45, who denies charges including conspiracy to phone hack, and others at News International to be "extremely worried about what Clive Goodman would do, or say, in the course of defending himself". Mr Edis continued: "We can see that they had every reason to be worried." The court heard that concern about keeping Goodman "on-board" was also felt by Mrs Brooks when she was editor of the Sun. Mr Edis told the jury about an email exchange between Mrs Brooks and Goodman in which she offered him a job shortly after he had been released from prison in 2007. The court also heard that a source in the military had provided the Sun with a photograph of Prince William at a party while he was at Sandhurst. An email from a Sun reporter to Mrs Brooks stated: "My best contact at Sandhurst, who has provided a string of great stuff over a period of months, is offering us a picture of William at a James Bond party dressed as a Bond girl. He is wearing a bikini and an open Hawaiian shirt. "The chap who has the picture wants £4,000 up front. It will open the door for future exclusives and info." The newspaper did not run the photo. Mr Edis told the court that Mrs Brooks personally authorised payments to an MoD official via a Sun journalist. He said the only reason for the payments was to make sure the Sun got the story first and some involved the reporting of the deaths of members of the armed forces. "Sometimes these payments were about things coming into public domain anyway," he added. "In which case there was no good reason at all for the MoD source to accept money to leak them early. The only advantage of that was that the Sun would get the exclusive. "It may concern the death of an active serviceman... it really matters when it is released and how it is released to other people affected by it." Mr Edis said: "Mrs Brooks was involved in a conspiracy to commit the criminal offence of misconduct in a public office - and she knew it." Mrs Brooks denies conspiracy to phone hack, misconduct in public office, and perverting the course of justice. The court has heard that three former News of the World journalists, who are not on trial, as well as Mulcaire, had pleaded guilty to phone-hacking charges.